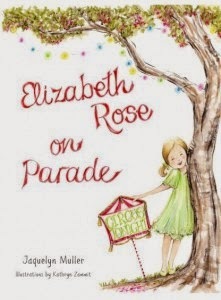 Elizabeth Rose on Parade by Jaquelyn Muller, illustrations by Kathryn Zammit, follows on from I Love You 5 Lollipops where we first met the truly sweet character of Elizabeth Rose. Once again this collaboration of author and illustrated has not disappointed, producing a book that captivates and brings the joy of the circus into your home. Elizabeth Rose on Parade see’s Elizabeth Rose lead the parade of circus performers, who happen to be her family, taking the reader on a rhythmic, colourful and fun loving journey. The words sit beautifully on the page taking the shape of the illustrations. The illustrations provide a colourful array of characters that open up to further language development. Your journey into the book starts with one simple question...Who leads the parade? Of course we can instantly look at the illustrations and see that it is Elizabeth Rose but we are engulfed in the excitement this little girl shows and the sign she holds...Circus Tonight. ‘It’s Elizabeth Rose. No one compares, why do you suppose?’...a question to tantalise our senses. I read this book to my 7 year old daughter who was delighted, smiling the whole way through. We had previously shared I Love You 5 Lollipops and although this was close to 12 months ago my daughter instantly made the connection between the two books, telling me with delight that it was Elizabeth Rose and running to get I Love You 5 Lollipops off the shelf. So together we enjoyed two books instead of one. I can do nothing but praise Elizabeth Rose on Parade by Jaquelyn Muller. It presents as a high quality publication with a hard cover that not only invites but feels wonderful to hold. Elizabeth Rose on Parade is an all round winner for me that I definitely give 5 out of 5. Primary level worksheets are also available on Jaquelyn’s website.